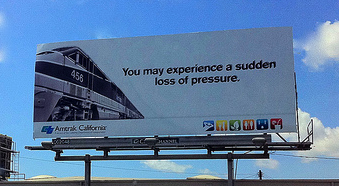 You may experience a sudden loss of pressure. I love it because, of course, I love train travel. If only, if only, if only, we had a train system like they do in Europe. Traveling would be so convenient and relaxing. Anyway, an extensive, high-speed rail system here in the U.S. is only a dream. It would never be funded. Plus, Americans are too attached to their cars. Isn't Earth Day this week? How about we all give up our cars for the day on Friday and hitch a ride on Amtrak? I love, love, love riding the train, too! Unfortunately our one Amtrak stop picks up at 4AM and takes 6 hours to get where I can drive in 3.5. I do use our light-rail whenever we can, though. Such a fun adventure for kids! Hi, thank you for following, I'm returning the follow. I love your blog. I loved traveling by Amtrak in my single days. Sure, I was always late to my destination, but I planned for it and the service was awesome! A thousand times better than any airline even thought of doing - they did everything they could to make sure any inconvience was made nice. Plus, I got to see just as much senery as if I drove, probably more because I didn't have to pay attention to the road. Can't wait to do it this summer with the kids!